Supply storage racks and carts with wire baskets are now available to facilitate improved organization and access to stored items. Their easy-cleaning construction makes them ideal for use in healthcare applications such as operating rooms, PAR, sterile services, and medical specialty departments, as well as in commercial, industrial, and food storage. Why should wire construction be your storage method of choice? 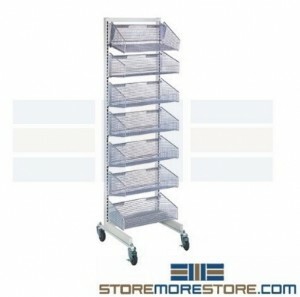 Supply storage racks with wire baskets promote a clean environment by minimizing dirt or dust accumulation and are easier to clean than solid materials. This makes cleaning up spills hassle-free, helps keep medical supplies and tools hygienic, and prevents stored materials from getting dusty and dirty. 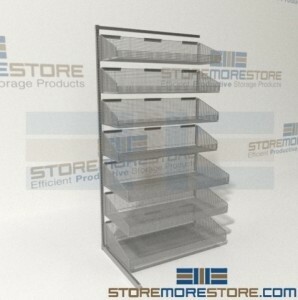 Supply racks with wire baskets are now available to buy online at StoreMoreStore. If you need additional assistance, would like more information, or just want help deciding which configuration would work best for you, give us a call at 1-855-786-7667.